Sales of tobacco in pharmacies send mixed messages to customers about tobacco’s health risks. Tobacco accounts for a small percentage of total sales in pharmacies but often is displayed prominently behind the checkout counter. Not surprisingly, tobacco users find it difficult to quit when it is sold in the same stores where they fill prescriptions. Pharmacies, as access points for health products and services, create confusion when they sell tobacco, conveying implied approval of tobacco use. With support from the California Department of Public Health’s Tobacco Control Program, ChangeLab Solutions partnered with the Stanford Prevention Research Center to develop this infographic, which draws attention to the mixed message of tobacco sales in pharmacies, illustrates the consequences of those sales, and highlights policy solutions that would increase the number of tobacco-free pharmacies in California. This user-friendly resource provides talking points and key information to get people started on implementing tobacco-free pharmacies. 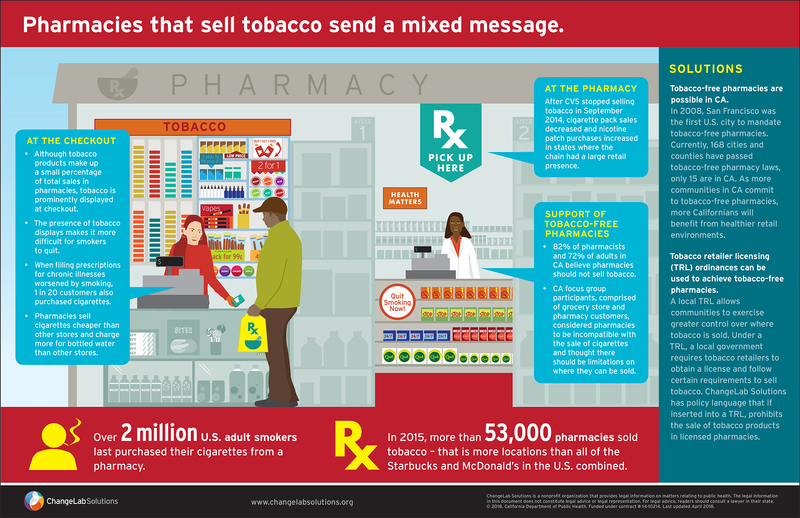 Residents, community health advocates, and decisionmakers can use this infographic to learn why eliminating tobacco sales in pharmacies is important and help them choose the best strategies for their community. To learn more about related policies and legal considerations, see our Tobacco Retailer Licensing Playbook and our fact sheet A Prescription for Health: Tobacco Free Pharmacies. Contact us for more information, subscribe to our email updates, and support our work.